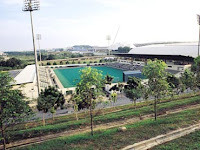 We have four hockey stadiums in the Kuala Lumpur area but only one of them is fully operational at the moment, that is the Tun Razak Stadium in Jalan Duta. The second stadium at Bukit Jalil has been under repair as the lights are being replaced and the national mens team had to share half a pitch with the womens squad upon returning from Dublin. The first pitch at Bukit Jalil has a depression on the pitch that has yet to be repaired and also has yet to get it’s lights fixed. At the Pantai KLHA Stadium the facility is unable to cater for night matches as many it’s bulbs need to be replaced.